Italy somehow failed to score despite dominating for 120 minutes, but won the resulting penalty shoot-out. Cesare Prandelli brought in Riccardo Montolivo to play at the top of the diamond, because of concerns over Thiago Motta’s fitness. Roy Hodgson made no changes from the XI that narrowly defeated Ukraine in the group stage. Italy were the better side all over the pitch here – only finishing let them down. This was a simple game – there was no progression midway through, no switch in systems, no key substitutions, no sudden change of pace. It was one system against another for two hours. Italy’s system wanted to dominate the centre of the pitch, with two passers at either tip (Andrea Pirlo and Riccardo Montolivo) and two shuttlers along the sides providing energy and forward runs. England’s system, at least in theory, offered more width. There were two key parts to the game – first, the width coming from full-back. Second, England allowing Pirlo to dominate the game. Italy had much more of the ball than England. This was entirely expected, whether you look at it from the point of view of systems or coaches. As a result, the formation battle was essentially on Italy’s terms, and England got dragged into a system they didn’t really want to play. In other words, they became too narrow. James Milner was drawn inside and played close to Daniele De Rossi, while Ashley Young also ended up in a very central position near Claudio Marchisio. Milner was suited to this role and performed his defensive duties well, but Young was uncomfortable defensively and also offered little going forward. 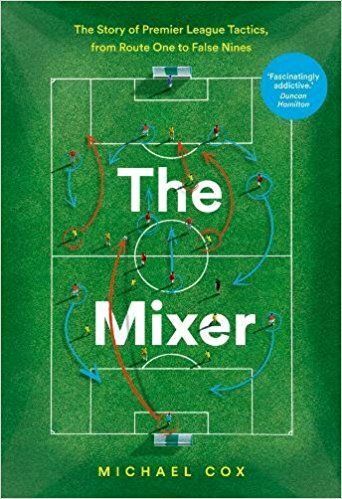 Hodgson may have been better making his side lopsided, asking Milner, Steven Gerrard and Scott Parker to deal with De Rossi, Montolivo and Marchisio, allowing Young to remain free for an out-ball on the left, to prompt counter-attacks. As England were dragged narrow, all the width came from full-back, from both sides. England started brightly in this respect, as Glen Johnson attacked down the right and had the game’s first clear chance, when he got the ball stuck under his feet in the penalty box. He also put in a couple of good crosses, and England seemed to have the right idea when they had the ball – but after half an hour, Johnson was much more restricted in his movement. The more the game went on, the less of the ball England enjoyed. And that meant Italy’s full-backs had much more license to get forward, stretch the play and increase the active playing zone, making England work harder to cover a large amount of ground. The Italian full-backs played significantly higher up the pitch and influenced the game more, and although they rarely provided great service into the box, they forced England back. More important, however, was the freedom Andrea Pirlo enjoyed. At times England’s shape was good, bringing both strikers back into the midfield zone, remaining compact and getting both Danny Welbeck and Wayne Rooney goalside of Pirlo. When Welbeck was in a position to close down the Juventus midfielder, he generally did his job excellently. Rooney was much sloppier, and after half an hour when Pirlo’s dominance had become clear, Joe Hart was clearly heard shouting at Rooney to pick him up. Hodgson clearly wanted Rooney to do this, because for much of the game Rooney could be seen half-heartedly jogging towards Pirlo. It was reminiscent of the 2011 Champions League final, where he started off marking Sergio Busquets, before gradually leaving Manchester United outnumbered in midfield. It’s odd that Rooney’s tactical indiscipline has become such a problem – only a few years ago his willingness to sacrifice his own attacking game for the good of the team was reagrded as one of his main qualities. England could have done with someone like Rooney’s club teammate, Park Ji-Sung, who did a superb job on Pirlo in 2009/10 – Urby Emanuelson did something similar for Milan earlier this year. Leaving Pirlo free was suicidal, and he completed over 30 more passes than any other player. And these weren’t just sideways balls, either – though he did help to spread the play to the full-backs. Many of them were the game’s best passes – he started off by trying to find Antonio Cassano, who was causing John Terry problems, but it soon became clear that Mario Balotelli’s pace was Italy’s main threat. One situation summed it up – Pirlo got the ball in his own area, jogged forward with the ball for 30 yards before thumping it over the top for Balotelli, who was denied by a last-ditch block from Terry. There was no pressure on Pirlo, and he subsequently created another fine chance for Cassano at the far post, who knocked the ball towards Balotelli in the six-yard box. England never dealt with Pirlo directly, but they (presumably) inadvertently stopped him being such a threat by dropping increasingly deep. In the first half England had kept a surprisingly high line and were caught out by balls over the top, but the more Italy dominated possession, the more England were scared to leave the edge of their own penalty box. Therefore, the space in behind had vanished, and Pirlo’s only great moment of creativity in extra-time was a similar pass to his earlier ball for Balotelli, shortly after Rooney had lost possession in the Italy box, when England were high up the pitch. But England attacked so rarely, and Italy might have benefited if England had come into the game more and left gaps at the back. England actually defended well as a unit in the final hour of the tie, with their narrowness allowing them to make plenty of blocks. The benches played little part in the game. Prandelli brought on Alessandro Diamanti for Cassano, Antonio Nocerino for De Rossi, and Christian Maggio for Abate. All three were influenced by fitness concerns over the departing players, and the shape of the game changed little. Hodgson’s double substitution was slightly more about strategy, even if the formation remained the same. Theo Walcott on for Milner theoretically offered more counter-attacking ability, but Walcott never seemed to get the right pass, with Parker noticeably overhitting a couple towards him. Andy Carroll replaced Welbeck to provide more of an aerial route – this helped relieve pressure, but England rarely got players close to him. Carroll and Walcott were the logical players to introduce, although taking off Milner and Welbeck was debatable - Milner was at least suited to the defensive challenge, while Welbeck was playing better than Rooney and would have done more to shut down Pirlo, if asked to play behind Carroll as he did commendably (albeit without attacking success) against Sweden. Jordan Henderson replaced Scott Parker to provide energy. That made sense – Parker was exhausted, Gerrard had cramp and was sitting deep, while Henderson has previously done well as a substitute simply by providing fresh legs and mobility. But Italy were the better side for the vast majority of the 120 minutes, and it was right that Pirlo provided the most thrilling moment in an Italian shoot-out victory. Italy’s diamond controlled the game, and Pirlo was the star player – he set the tempo and created chances. England’s failure to deal with him was criminal, and Rooney’s defensive role must be questioned. Italy also dragged England narrow before attacking through the full-backs, and they really should have won the game in normal time. We’re still waiting for Italy to produce completely convincing display – for all their dominance here, their finishing was dreadful. They’ve only scored one goal from open play in the competition, and have only beaten one side, Ireland, who had already been eliminated. Their possession play is impressive and Pirlo has been one of the competition’s star players, but they’ll surely need to be more ruthless in the final third to win the competition. England simply weren’t good enough here, and while individual decisions can be questioned tonight (the handling of Pirlo, and the substitutions), Hodgson’s overall approach was right for the competition. When inheriting a side at such short notice, particularly a squad without great technical quality compared to either sides in the competition, it made sense to focus upon organisation and shape. The defensive performance wasn’t always impressive, but England didn’t lose a game. With more from the likes of Young and Rooney, England might have overachieved – although the non-performance of talented, creative attackers can’t be divorced from the use of a functional, defensive system. There was rarely a clear transition plan – that was evident tonight, with the wide players dragged inside and in no position to launch an attack. For Hodgson, the real test starts now. Such a reactive style of football is entirely forgiveable for a short-term project, but England have to be in a position to play a more proactive, flexible brand of football if they want to be genuine contenders, rather than organised underdogs hoping to get lucky. I think that sums up his tournament to be honest – was shocked he was still on the pitch when extra-time started. Could have started Oxlade Chamberlain. it’s unfair to pin your hopes on an 18 year old, unless his name’s Pele. pele? the guy who is as good as rooney? like hodgson said? I admit that I expected Walcott sent onto the right, Milner shifted to the left, and Young off. Pah! And Carroll on for Rooney might have been worth trying too, as ZM said. Still, that’s all detail. Hodgson has done well to get this thin squad this far. As for tactics, he needs to find an answer to being outnumbered in central midfield. That answer is not Rooney, who again looked more League One class than world class. On a two year time-scale there is no answer to the lack of skill of English players – that needs generational action. You could hire a fair number of youth coaches from the continent for the sort of moolah handed to Capello and his gang. Why not develop your own youth coaches? That’s the problem right there: England buys foreign. It’s also why the EPL ruins English football. The amount of money and the size of playing population/number of professional clubs differs immensely between Ireland/Scotland and England. If you can’t see the difference, well, I can’t help you. On the other hand I could agree and say, sure don’t blame the foreigners. The English have no excuse. They’re just plain crap at football. in total agreement with you last comment . @Joe90: You have balkan countries that are under 10 million people so it doesnt explain the bad quality of scottish footballers. You dont need 70million people to have a defensive 4 of Vidic, Subotic, Kolarov and Ivanovic. And even smaller in size are the Denmarks and Norway which produce quite a bit of quality even at a very small size. So no, the size of ireland and scotland do NOT explain the putrid quality. Italy, Germany, Spain, Portugal, France and the Netherland all buy foreign. In addition, a good chunk of the better talent of some of those countries plays in other leagues. Yet those sides have out performed England over the past 20 years. England rolled out a starting lineup made up of players from Man City (Hart, Lescot, Milner), United (Rooney, Young, Welbeck), Chelsea (Cole, Terry), Spurs (Paker) and Liverpool (Gerrard, Johnson), with subs from Liverpool (Carroll, Henderson) and Arsenal (Walcott). Every player was from one of the top sides in the country, and with the exception of Henderson and Carroll, a regular member of those sides rotations. Henderson was on the side only because a better player from United begged off coming to be a bench player (a rather big error by Hodgson in his handling of Carrick). Carroll was there largely due to Hodgson’s desire to have an old fashioned English Target Man on the side if the right opponent / situation presented itself. The problem isn’t foreign players in the EPL because this is a side of guys able to be in the rotation of the best sides in one of the very best leagues in the world. It’s that those players just aren’t very skilled and talent relative to the best nations. I mean, who would start from this team for Germany? Who would even make the German squad? I know we’d all love to say Rooney, and as a United fan I would like to think that. But the performance today was horrible, and Michael’s pointing to Rooney’s horrific defensive effort isn’t an isolated thing: this is how he’s been playing for more than two years since Ronaldo and Tevez left. None of the midfielders and wongers England fielded would even make the German squad: the wingers and midfielders on the bench for Germany are all better than anyone on the England squad. Backline? A younger Ashley Cole would let Lahm play his natural right side, but this isn’t prime Cole. Hart? I’d rather have the other guy, and suspect if City could pick either for free, they would too. One could do the same with the other top countries. Few English players would break into any of those lineups. This has been a known problem for two decades, and England has done little about it. Eh? On the radio, on the forums, etc, most England fans have acknowledged those ‘real reasons’ for the last 4-6 years. So puh-leez don’t make out we still have our head in the sand over why we have failed. Maybe you could accuse us, several years ago, of burying our head in the sand but not in recent times so cut out that nonsense please. We know the score. We don’t ask for the manager to use 4-4-2, we didn’t ask Capello to do that and we didn’t ask Hodgson to do that. We didn’t ask England managers to keep on using the likes of Gerrard and Lampard despite their inability to orchestrate possession on the international stage. The FA has a lot to answer for in terms of their overseeing of youth development in the last 30 years. Still don’t know what SIR Trever Brooking actually does. “a better player from United begged off coming to be a bench player (a rather big error by Hodgson in his handling of Carrick)”: Carrick cried off long before Hodgson was appointed, according to the stories I’ve read. While I do agree that it’s extremely simplistic (and largely wrong) to blame all of England’s problems on the number of foreign players in the EPL, you statement is quite misleading. Out of your list, Germany, Portugal, France and the Netherland all tend to have a very clear majority of national players in their top teams. For Italy, it’s debatable depending on which teams you cinsider over the past few years (Mourinho’s Inter or today’s Juve?). In Spain, Real have a lot of foreign players, but the Spanish national team is largely built off Barcelona (need I say more about Barcelona?). As for national players moving abroad, it’s a completely different issue: it simply shows that the English/Spanish/German/Italian leagues have more money than the others. In short: you can build a great German side based on Bayern’s and Dortmund’s squads, you can build a great Spanish team based on Barcelona’s squad, but you can’t build a great English team based on Chelsea’s and City’s squads. Now, I don’t think it should be seen as the cause of England’s woes – but I think it is a very clear symptom of England lack of proper youth development plans. English players aren’t magically worse than Spanish or German ones: when you have enough young players and enough money, you have the potential to train world class players, but you have to make it happen… As Germany as shown with all the works they have done to improve their youth development since the late 90’s, and they are reaping the rewards now. And how would you develop them? You’d bring in foreigners to teach them how. he was the only man on the field who was able to come on top in one on one challenges and was discplined and kept maggio quite when he came on . by far he was a good performer last night consisting of an england team who cannot dribble and make 4 good passes . What do you mean when you say “finishing let them down”? Italy created very few clear cut chances in the whole match. They had a couple of quality chances. De Rossi’s miss in the second half and Balotelli’s first half miss comes to mind. England did do a decent job overall, they remained disciplined and some of the blocked shots were unreal- Rooney, Terry and Lescott I remember off the top of my head throwing themselves into hard strikes. It is possibly to reflect on the massive amount of shots they had at goal. At some point in extra-time i saw a statistic that said something like 23 shots (14 on target), and that could’ve possibly been higher. 14 on target at least gives you the impression that there was poor finishing involved, even though the clear-cut-chances didn’t happen in droves. Other than that, Pirlo just went from a darn fine footballer, to a absolute bad arse, in my mind. I cannot imagine the size of his jewels, to to pull a Panenka at that time. Against a good Keeper, too! The statistics are in favor of going down the middle since keepers most often dive to a side. I was just happy to see someone with the stones to actually do it properly and not hammer it over (or into) the crossbar. Pirlo said he saw Hart move and just decided in that split second. They had more than enough chances to score at least once. Excellent analysis. Pirlo was insane. I mean out of this world, such an outstanding player and at 33 you wonder what’s next.It would have been an injustice if england won. As for England, it’s the same old story since 1966.Passion over technique. Maybe with guys like Wilshere, Cleverley,Welbeck and the likes they may finally evolve into that technically gifted team we all want to see. I do hope Germany gets to the final though, so they can get their revenge on Spain. A spain germany final with germany winning is the best revenge. Pirlo has just told Ronaldo not so fast for the Ballon d’Or. With the world watching he put on the display of the tournament. If Italy win the Euro, Pirlo after an undefeated season with Juventus, and this run should be the title. - Again Pirlo for Ball D’Or if Italy win this. - Balzaretti reminds me of Grosso from 2006. - People are just starting to notice Marchisio as a great player. - Diamanti to start over Cassano if you ask me. i think germany are going to make italy explode, i’d say 2-0 to start. i also think Joachim Low may consider starting Muller as the number 10 instead of sometimes lazy ozil to anihilate Pirlo as much as possible. I think Italy is more concerned about putting someone there to annihilate Ozil than Germany trying to Annihilate Pirlo. But I think in the end, Pirlo and Ozil will just cancel each other out. i didn’t see it that way but yes i agree that ozil is a (bigger) major concern when he has space and nobody able to shut him down. maybe Low will still put muller on pirlo after the 2 goal advantage at the 60 minutes mark but what ever, Low and Prandelli have headaches coming due to the possibilities and tactical intelligence of their opponents. 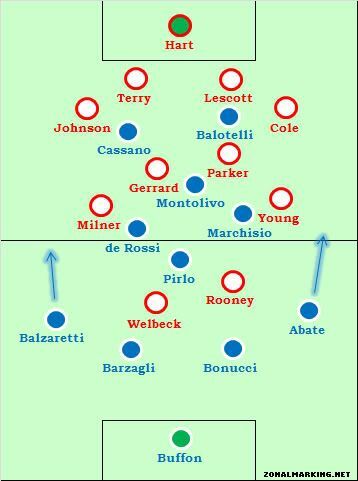 Mourinho employed this tactic in 2010 CL match vs AC Milan. Oezil was quite successful in shutting down Pirlo, but as the result, he was missing from RM offensive game. That was when he was still too weak in doing more defensive role though. He’s made much improvement and got stronger in midfield in his second season in RM. Best indication was the last el clasico, where he made excellent game in balancing defensive and offensive role against barca. When Germany have the ball, Özil mostly plays on the flanks rather than staying in the center of the pitch, so I don’t think it would make much sense for Italy to put someone to “annihilate” him in Pirlo’s position… IMO, it would make much more sense to tell the shuttlers (De Rossi and Marchisio usually) to follow him when he’s playing on their side. agreed. if anything, ozil can be too selfless. and i certainly don’t see muller as being more industrious than ozil. isn’t this the reason why kroos is preferred to muller in bayern? muller doesn’t offer the same work rate? I don’t think Oezil is lazy, but I think that stems from his general lack of stamina. More than a lot of other players, Oezil is flat out exhausted by around minute 70 of most games. Kroos is preferred to Mueller at Bayern? No. Mueller is less industrious than Kroos? No. No. No. I wonder where some commentators here take the courage to post when they clearly don’t know one end of a football from the other. Might be an argument for starting Gomez against Italy for defensive reasons. Although stereotyped as a poacher, for Bayern he often dropped deepest of the attacking four in order to fill gaps left by advancing midfielders when they lost the ball, and in particular Robben’s (absent) work ethic. While Gomez wouldn’t neutralize Pirlo, he would help more than Klose and Oezil. 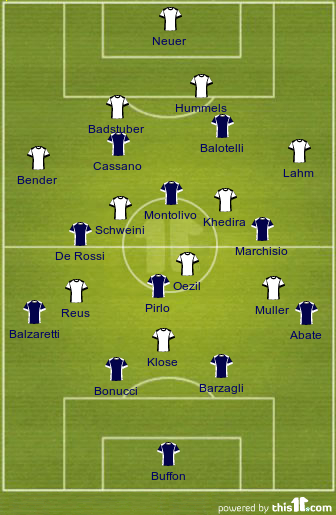 Germany will also have much more of the ball and be more proactive (should they choose, anyways, Germany could play on the counter if Loew deems it the best strategy) which will reduce Pirlo’s dominance on a game, although this could paradoxically make him more dangerous thanks to space in behind for his through balls. I think Italy will be more concerned about Germany than Germany will be about Italy. Pirlo in a deep role gives him space and time to dictate, but at the same time, Ozil will receive the ball in plenty of space as well. Pirlo will also be further away from Italy’s attack, and Ozil is incredibly good at abusing space. I think Germany will tear Italy a new one if Prandelli doesn’t place a body near Pirlo to limit space Ozil gets. Gomez’s greatest weakness until last year was that he didn’t do enough defensive work. He has improved in that respect, but not nearly enough to beat Klose who is known for his excellent defensive contribution. To base a plea for Gomez over Klose on Gomez’s defensive qualities is laughable. Actually Gomez has really improved greatly in his defensive contribution, the main difference between him and Klose in that regard ist not so much about ability, but about where it will be put in effect. Klose literally goes the proverbial extra mile, while Gomez usually sticks to a strip of about 20 to 30m wide in the center. I have to say that i did not rate Marchisio much before this game but as you said he is very good indeed. Only chance for Messi not to win the Ballon d’or is if Portugal win the Euro though. Pirlo will get in the top 3 if Italy win. Prantelli will probably make some changes for the next game because of tiredness (i expect Di Natale, Germany leave a lot of space behind and if they let Pirlo pick his pass they will be surprized). If you remember last EC Ozil did shut down midfield with playing very defensive. So I don’t agree he is a bad defender, and Gomez would be a bad choice since if they chose to play more defensive with attackers helping extensively in shutting this Italian diamond they will need someone who is quick with the ball and can produce a pass to destroy Italia from counter attack. dream on hope we can talk this after the german game and not how sluggish italy are and how marchisio is not even trusted by his club team pirlo and is not passed the ball on the field . just tell me how many touches did he had . diamanti came when opposition was all exausted and did nothing great . putting a performance against a stupid england team is no big deal hope he can replicate that against germany . Sorry but as much as I like Pirlo, he was very good. Not great or insane. I love to watch players control games but waaaaaaaaaaaaay too many times during this one di we hear about his marvelous side passing to fullbacks. I get that not every pass is a Hollywood one but it just seemed like everything he was doing was being blown up. It was sort of like the boy who cried wolf, after a while it was just white noise. youve obviusly havent watched an MLS game (dont bother) when the best english player ever is playing. anything he does is considered amazing, back passes, throw ins and dont let me get started about corner kicks. he then loses his man twice in a row and the other team scores so then they redouble the effort to make it seem like he is dominating. This of course was not the case of the Pirlo game but I do agree that in a tight game announcers will often decide who the defining player ofthe game is and then go into full PR mode. And yes, I did see Pirlo give it back to the keeper and it was hailed as a savvy veteran move. Which it was but it was one 99.9% of players would have done. It bothered me not because it wasnt a great play, it wasnt, but because it diminishes the value of his brilliant movement and passes. >It was sort of like the boy who cried wolf, after a while it was just white noise. How about you stick to one metaphor at a time? I don’t know. If you follow youth and amateur divisions (u21 and younger), this is the way England feels comfortable playing, or at least, the system coaches are pushing. Rather than Hodgson reverting to an attacking, proactive football, I think he is going to try to perfect the current one. England can’t play like Greece with 10 men behind the ball.They should control and attack in order to show that they are coming from the best domestic championship! EPL isn’t the best league, it’s just the richest. In foreign money and foreign players. But , the foreign money and players increase the quality of the league. I meant that English players/coaches have nothing to do with EPL being the “supposedly” best league in Europe. EPL may be the best in terms of overall results (debatable), but in terms of football style/tactics they’re not even close to Serie A and La Liga. Agree,EPL without foreign players and coaches will not be the same. I think that’s a pretty gross generalization, also fairly subjective, no? Who’s to say what style or tactics are ‘better’ than others, or more evolved? Clubs in England have their own tactics and style that they thrive on, just as much as the other leagues do. Italian football isn’t always particularly exciting, so English teams’ tactics can hardly be judged on entertainment level either. It is indeed subjective. I forgot to write “in my opinion”. Generalisations are not always wrong. It is not gross to say that Spanish/German sides invest more in their youth programs. It is not wrong to say that historically most tactical innovations were born in Italy. Don’t get me wrong, I think EPL is interesting because it’s a melting pot and there are a lot of stars. But I am convinced that marketing plays a big role in it being globally perceived as “the” football league. Apart from Pirlo (and Balotelli at times) they lacked any real quality going forward. A lot of moves resulted in long shots. cant hold the ball. same old story. Again, as in France’s game i thought at one point england should have switched to 4231, milner next to parker, gerrard as a #10, rooney on a side (i’d choose left) and young on the other. 442 allows rooney to be at his second striker best position, it gives gerrard the freedom to be at his best, but it makes it just too physical to last a whole one freaking month long competition !! Especially in this game with pirlo dominating freely like he had: making rooney drop on him or gerrard press up on him is not the same thing it’s the double running !! Most of England’s faults have already been discussed already; they were torn out of shape, and they couldn’t compete in the center of the pitch, with most attacks being snuffed out by a crowd of blue shirts. That’s a problem playing reactively, the opponent dictates how you play. Hodgson needed different players to combat Italy’s system. Someone like Ramires could have been useful. I’d also like to point out how often De Rossi, especially in the first half, dropped deep and became a left center back. Him moving up the pitch in the second half coincided with Balzaretti dropping deeper, and his replacement, Nocerino, ended up noticeably higher up the pitch, acting almost as a left winger. Italy looked like three at the back a lot, with the rb always pushing up, while De Rossi and Balzaretti stayed deep during different parts of the game. I’m not exactly sure why Italy did this, but it seemed to neutralize England’s right flank. It also seemed to give De Rossi a lot of time on the ball. The point about Ramires is a great one to counter those that might say England should play like Chelsea did under RDM. To have a ball-winner and counter-attacking player like Ramires makes a huge difference. The only player I can think of that can do this for England is Oxlade, who played like that in the second tie against Milan in the CL. Actually Milner is the closest England have style wise to Ramires he just isn’t as good. Slow, lumbering, poor finisher, technically inept, English, white. They are both players who can excel as a “runner” in the midfield or a defensive winger. They have fantastic stamina and workrate. Once again Ramires is clearly better but the same type of player. very nice description but you missed one more he should be joined in the there with henderson and downing dont know how they made the list atlease hodgson could had made a better team with players from swansea city who could had done better . their both wingers dyer and sinclair were good and quick . grant holt was another player who should had made the squad but inept hopeless guys like terry , henderson , downing , milner made the squad . hodgson cannot hide from this criticism he has to face it . Gerrard is. A position swap with Milner could have let him receive tha ball wide then burst forward, with his pretty good technique and speed. Also, Milner bases his game on stamina and selflessness, as well as his aptitude for both attack and defence. He is also more disciplined than Gerrard. If Hodgson had more than 2 months to work on this team, we could have seen this at work too. Theoretically though, it’s the right choice. in which world are you living man milner swapping for gerrard are you joking man . didnt you watched last night most of the italian offense came from left side because prandelli had rightfully deduced that they could open their defense from that side and they would had done had they shown a little imagination which doesnt means that milner was great . that stupid players if he had been in the central position then he would had gone chasing around like a british bulldog and would had been played and would had exposed the defense to opposition . how can be even in the squad is beyond me . Oxlade’s defensively ability is very much unknown. He didn’t play in a similar role against Milan, although he did play deep but still different responsibilities. 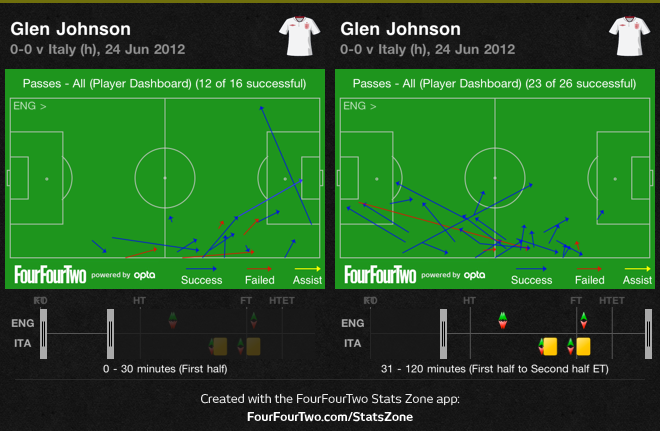 England’s failure to negate Pirlo and England’s poor attacking threat after 25 minutes are two sides of the same coin. If they pushed up, they’d find themselves opened up by a pass over the top to Balotelli. England had two ways of dealing with this – have a forward mark Pirlo, or stop attacking. They chose the latter, and so they deserved to lose. Why didn’t Phil Jones play with Parker and Gerrard to help against Italy’s 4 midfielders? Why play with 2 strikers and hope that 1 of them will be fine playing as a DM against Pirlo for much of the game (Im talking about Rooney here)? Why not just play a proper midfielder instead? Why play Ashley Young if in this system he would essentially have to play as a DM to contain Marchisio’s runs? Roy’s strategy was just diabolical today. was he marking marchisio who was on the opposite side and most importantly he was up against abate against whom he did very well also in that crap english side he was the only player who looked like of creating something . i dont hear people talking about milner who was by far the most hopeless player in the line up ( i wonder how could he be even in the team and for once i am in agreement with barton ) . loosing the ball cant dribble very lethargic imagination that is thing he was never born with . Imagine if Capello had played like England did this whole tournament? The Greeks were the go-to joke for the English pundits all tournament, when England more or less matched them in their ‘negativity’. ‘On the verge heroic victory’ they said before tonight’s game, completely overlooking the Italians. Eyeing up the semi with Germany. A nice slice of humble pie served up tonight. When will they learn that England are really just an average team at best, and always have been. Oh come on. England may not have set Europe alight at this tournament, but they never plumbed the depths of their South Africa performance. The comatose Algeria nonevent, and the complete defensive incompetence of the Germany humiliation, will hopefully never be matched in the Hodgson era. Rubbish. Average teams don’t qualify for as many major tournaments as England and certainly don’t get out of the group stages as often as England do. England are a good team. No more and no less. We are nowhere near the level of great teams like Germany, Italy, Brazil etc, but we are consistently a top ten team. Let’s have some perspective please. But that’s the point. England, with the population of ~65 million, one of the richest countries on Earth, and the cradle of the beautiful game, should be doing a lot better than just being a good team. The have every resource to do so, they just refuse to use them efficiently. I think in high level football you can’t have a 442 with wingers, you need to have more wide midfielder players than wingers, and this also explains why england couldn’t keep possession. You could even argue you can’t have 2 strikers in a top level one month competition, but let’s say with rooney dropping deep and defending energeticaly it’s an option. Why can’t a 442 with wingers work? because it’s a 424 when attacking, so either you defend, either you counter attack and score, either you counter attack, lose the ball and defend, you won’t go anywhere this way. So what would be the solution? to have more passer, playmaking players on the sides instead of aggressive dribblers, high risk high reward gamblers. Does England have such players? Well Downing kind of is one of theses players, but he’s no revolution, and one player is not enough for two sides of the pitch ^^. what are you talking is it making any sense . They weren’t lucky?? They were lucky enough to play more 30 minutes!! lol Just joking (kinda), i understand what you meant. There isn’t fairness in football but damn, it would have been really unfair to see England’s name next to Germany, Spain and Portugal. They were bad the whole tournament and in this game they simply got dominated basically the whole game. Italy did what they wanted, when they wanted. The only good thing i saw was England’s defense. If it wasn’t for the back 4 this game could have easily ended 2/3-0. I can’t imagine how the game against Germany would have been is England went to the semi. Would have been even worse than in the WC 2010. Italy may deserve being in the semifinals more, but it’s pretty clear that right now Spain and Germany are leaps and bounds better than any other side in Europe. I’ve never been convinced England is a “great football nation.” Take out 1966 and what do you have? Sweden? Belgium? Are you seriously putting France and Italy on the same level? Both now and historically? France will get back to being relevant only when a new incarnation of Napoleon will emerge (Platini, Zidane…). Italy are regulars at this level. Ditto, star quality or not, tactically the Italians are usually a tough cookie to crack in international tournaments. But this was just work rate. His hunger and desire for the ball led to him chasing to get it, working hard for the team. Tracking players and doing man marking jobs on the likes of Pirlo and Busquets is completely different. Hodgson shouldn’t have played Rooney in the role of marking Pirlo, yes his position means he’s the obvious choice for it, but he did a poor job at marking Busquets so obviously isn’t cut out for the role. It’s as simple as that, why did Hodgson still do it? Hodgson’s choice of making Rooney do the job on Pirlo basically led to Pirlo dictating the game. Few other notes, Ashley Young was absolutely appalling tonight, and has been all tournament, how many basic errors can you make and not get taken off?! Milner is not an international standard player, so technically inferior it’s scary. And will people stop considering Steven Gerrard a world class player now? His game too tonight was riddled with basic simple errors, and he got showed what a world class midfielder was tonight, and he was showed by Andrea Pirlo. Same old story for England at the end of the day, expectations rise, and we end up losing on penalty and the media look for scapegoats. Think there is positives to take though. Roy has got the players playing as a team, and for the first time in my memory, has got an England team disciplined, organised and playing to a shape. The negatives though is that we play like that because it’s pretty much our only way because we are so technically inferior to the top footballing nations it’s embarassing, and that problem still remains that despite being a ‘top footballing nation’ our players are simply unable to keep a football efficiently. The Rooney v Pirlo debate is fascinating. Of course, could you imagine the howls of derision if Hodgson said, “Rooney isn’t playing because we need a proper d-mid to mark Pirlo out.” Ok, so keeping arguably England’s best attacking player off the pitch isn’t going to fly, so you sit Danny Wellbeck? Really? Danny Wellbeck HAS to play too. So I feel for Roy. He’s got limited resources, especially to deal with someone like Pirlo. To be a top international side today, you need to have a deeper lying central mid who can have the game flow through him. Pirlo. Xavi. Schweinsteiger. No England player can play that role. As for Gerrard, there are certain elements of his game that are world class. For example, the searching ball, or the curling cross to the corner of the six…he is very good at that. But he really isn’t an orchestrator, a field general. Finally, I think the EPL is the worst preparation for the international game for England players. The game in England is frenetic — it’s all about speed, running 1000 miles an hour for 90 minutes. Technique takes a back seat. It makes the league fun to watch, but it’s poor development ground for an international side that wants to compete at the highest level. England will always be interesting, but they will never be great. Spain, Germany, Italy always have the potential for greatness. 4231, milner next to parker, so gerrard and him are not out of gas at the 60 minutes mark, rooney on the left. not even needing a substitution. So you would like to leave Cassano, Balotelli and Montolivo, all operating near the center of the pitch, to Englands 2 CBs? Or pull Englands fullbacks in closer? Forcing the wide forward players to track Italys FBs up and down the line, wearing them out? I think Germany will run into similar problems unless their wide forwards mark Italy’s CMs. But maybe Prandelli will switch to a 352..? Personally, I would just man-mark Pirlo out of the game (coming form a Juve fan). Ferguson, JS Park vs Pirlo , United vs Milan 7-2 agg. It had to be done. what didn’t you get in 4231? 451 if you prefer, one more player actually defending then in this 442, rooney defending like young, young defending like milner, milner defending like gerrard, and gerrard actually defending (NOT like rooney). you seem to think england played with 4 CM because of the 2 banks of for, they played low & a bit central & defensive because they had to fill the gaps for the 4v2 defensive mismatch in CM. 3 CM midfielders would have meant gerrard on pirlo (huge tactical benefit), milner&parker on montolivo & the one going forward with the ball between marchisio&rossi. And at the back it would have been 4v2 in our favor since italy doesn’t have two players per side, so one of our offensively skilled fullbacks completely free to move forward. the 2 defensive banks of four didn’t even make us a great team defensively it just allowed us to have one more non working player upfront, which was plain useless since we’d screw our counter-attacks in 15 seconds max. I understand what you mean, but you are still left with 4 Italian CMs vs. 3 English (unless you want the English wide forwards/mids to play in the center??). So Italy will still dominate the center of the pitch/possession. With the wide English midfielders having to track Italys fullbacks, the English fullbacks will have no direct opponent to mark, and will constantly get sucked inside to help the 2v2 between Italian strikers and English CBs. This creates gaps, which the Italian fullbacks will run into and force the English wide forward/mid player to track, wearing them out considerably and forcing the whole team back into their area. This leaves 1 maybe 2 English players up top, vs 2 Italian CBs, and an Italian defensive midfielder, and 1 of their fullbacks. 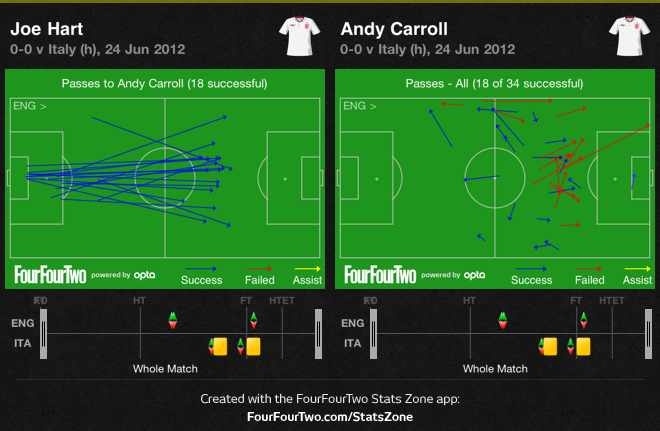 That’s why Carroll won a ton of long-balls but couldn’t make many chances, he was too isolated. Basically England forfeit possession by not matching the 4 midfielders properly. England can’t break through the middle because of Italys 4 midfielders, and cant break to the outside, because their wide players are pinned back, at least in my opinion. They would’ve done much better if Rooney/someone was 2 yards from Pirlo at all times. If the Italian fullbacks aren’t tracked then the English fullbacks have to come up to close them down, creating huge spaces on the sides for Cassano and Balotelli to exploit, and pulling the English CBs all over. England have to track the only 2 Italian wide players (the fullbacks), or else they are severely exposed at the back instead of the midfield. and the midfield is not out of shape with the 442? milner and young playing centrally and low like they did? what’s worse, Rooney didn’t even look fit enough to track back anyone. The United States and England have the same amount of top 3 finishes in the World Cup . . 1. Belgium, Denmark, and the Czechs all have better historical results in the European Championships. Winning the most controversial World Cup Final 46 years ago on home soil does not a “top footballing nation” make. England looked simply dreadful when they had the ball. They would try simple give and go passes only to pass the ball back to Italy. Literally. What a horrendous display of skill or lack thereof. Come on now, theses guys are supposed to be the best in England and they can’t even get a few basic passes right. Something needs to be done at the grass roots coaching level. What a disgrace! And having said that they still could’ve put Italy away in the shootout. Wow! That doesn’t say much for Italy, does it? Italy’s attack is very weak. When a player like Balotelli is your star player that means there is something wrong with it. I am wondering why Borini is not getting any play time when he was probably the striker that scored the most goals per play time in Seria A this season and is very composured for his age. Especially when it is obvious that your forwards are costing you games and easy wins. Balotelli has played well so far- his pace in behind was important (as noted in this article), and he can score from distance or nab a volleyed finish from a set piece creating a scoring opportunity from nothing. He also is a fantastic penalty taker. Even if you wanted to take out Cassano, who hasn’t been great thus far, Giovinco and Di Natale would get time before Borini. Di Natale is pretty composed for his age as well I bet. The last time Borini played for Italy they lost to the United States- probably not a good sign when you are stifled by Clarence Goodson (He did look energetic, I’ll admit, but pure energy definitely isn’t enough). Especially when the time before that… oh, I forgot, that’s his only cap. He’ll be a good player in time, but don’t say he should play before di natale or giovinco. The problem is that Rooney is the best England player and he cannot play well as an one top striker so Hodge need to think about striker partner of Rooney. It means one less midfielder in line up so you often find yourself lost control of a game. Furthermore, England Central midfielder often type of player way too direct at attacking so lost possession too much as a midfielder, It force England team defend more so players get tired and lose a game in the end. England need a CM who understand it is better idea, let your attackers score goal and you just play to support attack and keep possession, marking out opposition stuff, in other word, you need good standard midfielder player. Just watch what Alonso or Xavi did for Spain team that is the midfielder text book stuff. “The problem is that Rooney is the best England player “: that might be better as “The problem is that Rooney on his day is much the best England attacker”. Trouble is, that day isn’t dawning for England, and is dawning rather erratically for ManU. At 26 he looks a busted flush. A pity, but there you are. Say what you like about Rooney for England but for United, he has done more than well to say the least. Busted flush for England maybe so but club, don’t be stupid. I would probably take a “busted flush” that scores over 25 goals in the league. That’s coming from a Chelsea fan. England just dont have the quality necessary to win in games like these. Greece won the Euro in 2004 but that was a one in a million deal. England do not have especially talented defenders and they do not know what to do with the ball in the little time they can actually get a hold of it. Rooney’s lack of sacrifice was a big weakness, letting Pirlo get time on the ball means your chance to win just went down by 50%. It will be interesting to see how Italy will lineup against Germany with Motta coming back into contention and Diamanti and Nocerino performing well, and the possibility of Di Natale over the misfiring Balotelli. “For Hodgson, the real test starts now. Such a reactive style of football is entirely forgiveable for a short-term project, but England have to be in a position to play a more proactive, flexible brand of football if they want to be genuine contenders, rather than organised underdogs hoping to get lucky”. But Roy has always prioritised position over possession! He is not the type of coach to to bring about the needed change. Best candidate for the short-term; bad choice in the long-term. It’s not too bad, quarter-final was par for the course and better than looked likely before the tournamanet started; but, Italy looked like Spain agains us which they are not. I read Henry Winter’s observation that in training Milner, Rooney and Young had practiced closing down Pirlo and thought “well there goes any hope of doubling up on their fullbacks”. If I were English, I’d be dreading the next two years if Hodgson is committed to this tactical approach (and I have a horrible suspicion he is). I’m sure England will qualify for 2014 with few problems (most likely with a cautious, safety-first approach which Hodgson will justify by saying that qualifying is paramount, however it is achieved), but if they arrive in Brazil and play with this mentality and set out to defend and counter, the best they can hope for is an ‘honourable’ second-round exit. Which is not progress, and will be mind-numbingly dull for supporters. When Hodgson was appointed the papers carried a recentish interview with him where he said words to the effect of he’d always use a back four but that there were different ways of arranging the front six. The problem may not be the tailor but the cloth. That’s true, and the likes of Welbeck and Oxlade-Chamberlain will most likely improve a lot in the next 1-2 seasons, as will possibly Walcott and Sturridge, so England could have a few more potent attacking options by 2014 (plus the likes of Wilshere and Cleverley in the midfield to (1) keep possession and (2) use it wisely). But I think Hodgson is a cautious man, and will play ’safety first’ more often than not, particularly in England’s initial WC qualifiers in Sept & Oct (which include trips to Moldova and Poland, and home matches vs Ukraine and San Marino [that one will be an exception to the rule, you'd think]). I think England will top their World Cup qualifying group with few problems, quite possibly undefeated and conceding very few goals, but very rarely play anything but a defensive 4-4-2, whoever the available personnel is. England aren’t renowned for being tactically adaptable, and I think if Hodgson’s methods continue to ‘work’ (i.e. England pick up 8-10 points in their first 4 WC qualifiers), this will become the default ‘England way’ for the next World Cup cycle. Yes: I was about to say that. Ashley Cole’s kick was saved easily by Buffon. I still fail to understand why a left back who has NEVER scored an international goal would take a penalty. Because he took one for Chelsea in their CL final shootout. Besides, England had few valid choices: the fifth taker would most likely have been Walcott. Beyond those five, the alternatives then were: Lescott (not likely), Terry (no comment), Henderson (too inexperienced), Carroll (inexperienced and suspect temperament for the occasion), and Johnson. Ultimately, it had to be Cole or Johnson, and I can see why they’d choose Cole. I was actually confident he would score – I knew England would lose, but I expected Rooney and Walcott to be the ones who missed. It was so obvious Cole would go bottom right. I called it before he put the ball on the spot. He did the same in the CL final in Moscow and went mid-height to the same side in the most recent CL final. Without knowing those facts though his run-up was easy to read also. A quality keeper like Buffon – still one of the world’s best – wasn’t going to miss the cues that Cole gave out. I loved the point he gave after saving it too! Generally, players shoot penalties to the opposite side to their favoured foot – leftys shoot right, rightys shoot left. Quality penalty takers who usually convert are harder to predict e.g. Diamanti passing it to the left corner, Pirlo’s chip. It was quite fun to watch and guess which way the players would go. agreed. I feel like its players that cross a lot on their stronger foot that always go opposite (so most fullbacks would fall into this category). I would add Balotelli to the list of quality pk takers because he always sends the keeper the wrong way. Even with the complete stutter step banned, he slows enough to look them off- and go hard and low to either side. England were even poorer than Ireland this game. That just shows how lucky they were until now. If Italy had better strikers or number 10 they could easily score 2-3 goals. It also seems that people forget about De Rossi who dropped deep to help Pirlo spread the game and Italy found themselves often with 2 deep playmakers, which allowed them to control the match. It did not matter much if Rooney or any other forward will close down and mark Pirlo in the end. Rooney might have the work rate to mark a deep playmaker, however in my oppinion he is far from the class (intelligence and discipline wise) to do it against a smart playmaker like Pirlo. I think Italy might stand a chance against Germany. Their proactive style, holding the ball deeper and safely works wonders untill now, however they do need better finishers if they want to get the win. Germany are playing really well, but they still have to meet a team that likes playing with the ball rather beeing direct with it. Pirlo vs Yozil, Bastian vs De Rossi will be interesting battles and in the end we might see even Buffon vs Neuer! Good point about de Rossi. As good as Pirlo was, it was the far higher technical ability of the entire Italian midfield that made the difference. Italy had 4 midfielders all much better on the ball than any of the England midfielders. That allowed them to keep possession, control the game and eventually buy more time for Pirlo to pick out the final ball. Penalty miss aside, Montolivo was the 2nd best player on the pitch. Hardly. Pretty uninfluential from the half time break and forward in my opnion. Would not object to seeing Diamanti starting the semi over Montolivo if Motta s not fit. I watched the whole game, and this ZM analysis sums it all up, although it’s very polite abd wordy., haha. England turned in their usual incompetent, bumbling, third-rate performance, a bunch of unguided missiles praying for a break (can you spell ‘EPL’?). I predicted to my wife they’d be gone in the 1/4s. I should have put a bet on it. Their back four were the men of the match; the only reason why they didn’t get slaughtered in normal time. The mids and fronts were utterly absent. They were so utterly, utterly, crap, they should be ashamed of themselves. There’s no ‘1966 Jinx’, it’s as stated in the article: wake up and start playing modern football, or you’ll get even more nowhere. I was waiting for Italy to finally try a 4-3-3 as a reaction to England playing wide and was surprised and, in tactical terms, sorry they didn’t need to, as England desperately tried to compensate their lack of central midfielders by staying very narrow and letting Italy be the wide side. What a shame. The peculiar thing about the “Pirlo role” is that it’s something that doesn’t really exist in English football. Box-to-box midfielders abound and so do some of the more attacking variety (although most of these roles at English clubs are imported) but the only similar player I can think of in recent memory is Paul Scholes. England produces players with calibers and skills to perform the basic duties of Pirlo (for example, Scott Parker can beautifully turn and rotate in ways that are of similar effect; Steven Gerard can play extremely accurate long balls) but they often don’t have the wherewithal to play in that fashion and nor would they anyway when the team isn’t designed to tick as such. Talents abound at English academies and schoolyards and yet the country is maddeningly destined to affix to a style that is becoming rather antiquated in the modern international game. Pirlo is a special player, but I think Wilshere was a massive miss for England in this tournament. Not to imply he would be England’s Pirlo, but the added dimension (with his passing skills, vision and clever movement) he would have brought to the team would have been so valuable. That’s if (hypothetically) Hodgson had played him in a midfield 3 with Gerrard and Parker, which is no certainty (unlikely even). Technique aside, the English players are clearly pretty thick also. Too many don’t really understand the game tactically and make pretty stupid decisions with their movement and passing. Even a player blessed with Pirlo’s skills would probably not know how best to use them. This is clearly a problem with the coaching but also the type of individuals who are progressing through the system – not the brightest lot. If you look at say, La Masia, they value intelligence above EVERYTHING else, including the skills. Pedro isn’t exactly the most skillful player but he is very clever. Many people will be aware of the story about David Villa being more skilled but having to watch Pedro’s movements to learn how to play for Barca. People were giving Gerrard a lot of credit in this tournament. He has can hit accurate long passes and short passes shouldn’t be a problem to someone of his talent. But, he hasn’t ever seemed to learn how best to make use of it. Lampard is the flipside and is someone who has learnt to get the absolute maximum from his ability by using his brain. He has also learnt to adapt as his physical quality is declining (Gerrard doesn’t have the legs he used to have either). Sadly for England Lampard wasn’t available. p.s. My apologies for using Gerrard for this point, it has become a bit of a cliche. Well said Pat about Gerrard. I thought he too had a stinker of a game and tourney in general. i think Lampard remade himself this season much like Scholes did when his legs started fading. Carrick s another example who is entirely reliant on his intelligent movement to compensate for lack of mobility. Why is European football like this? All four quarterfinals had one team camping out in the other teams half. Yet at the same time the scoreline doesn’t show dominance of the winning team. Goals are both difficult and surprisingly easy to score. That’s what makes the game exciting. I don’t think European football generally is like that. I think European football is at a place where a lot of high-quality sides are in a “rebuilding” phase, France and Italy in particular (with the Dutch about to join them). And a lot of mid-quality sides are in that same place as well (Czech Republic, Sweden, England). The knock out rounds missed a good Russian team. I believe the 2016 tournament will have more quality and better parity, although the expansion to 24 teams could render that moot. The results of Spain and Germany clearly show the dominance, aren’t they? Or do you expect a 3-0 or 4-0? Neutral here. What a couple of cautious national teams. While I can understand the constraints when faced against a technically superior opponent, tonight I though both teams played it too safe. Italy’s 3-5-2 would have done the job tonight. They created far more against Spain and had better width. For England, 4-4-1-1 was utterly useless, unless you were going for 0-0 and penalties. Which I guess that was their main objective. Am I the only person that’s amazed that Jermaine Defoe was not given a single minute this entire tourney? Watching the last warm-up friendly vs. Belgium he looked very dangerous. England can complain about their hard luck but when you don’t use the weapons you actually have at your disposal it seems hollow. Why not run 4-3-3 with Defoe, Walcott/ or Oxlade, and Rooney as attackers? Rooney seems overmatched with Welbeck by themselves. England weren’t prepared enough to play a proactive style of football at the Euros, with their manager resigning a few months before. Plus, Hodgson doesn’t know how to play w/o two banks of four. England would’ve played more or less the same with Capello. They have been playing like this ever since Sven became coach. Yup Sven, Fabio Roy all peas in a pod. I agree with yout points, but just wanted to point out that Defoe came on for the Ox in the opener against France. Thanks Pontus for agree and correcting my mistake. That must have been the part when I dozed off. Just seems if your going to play that style that England played, you’d want the players with the most pace on the field at the end especially. For all the grief, Enland’s FA and the EPL have been getting, most national teams don’t have the luxury of benching a Jermaine Defoe. Not a perfect player but suited for this type of game/plan. Have to use all the weapons that you do have. I didn’t like England’s tactics at all, and they deserved to lose (to a decent but not spectacular – Pirlo aside – Italy team) in my opinion for playing like minnows in all 4 matches. However, that’s Hodgson’s choice, and to an extent the results in the tournament as a whole justified his tactical decisions and team selections. My major problem with England was how poor their execution of the plan was, how poorly they kept their shape, and how little basic technique they showed. All that stopped this tournament being a repeat of the 2010 World Cup was, I think, team spirit: in South Africa their were morale issues and it showed in a lack of character and confidence, here they seemed to have excellent spirit and self-belief, which kept them in matches. Having said that, if they had played Spain or Germany they would have potentially lost 3-0. Their passing was inaccurate, the movement of players was poor, the pressing in midfield was poor to non-existent, basic ball control was unacceptably poor – it’s all very well defending ‘heroically’ but you have no choice if you’re constantly losing the ball cheaply by unforced errors. I don’t live in England so I don’t know what people are saying, but for me England’s performance in the second half and extra time was (Hart and the defenders aside) as poor as I’ve seen from England, certainly on par with the 1-4 Germany defeat in 2010.
how is it that a country like portugal can out do England in every major tournament i can remember in my lifetime? You must be very young, Joe. Portugal: group stage. England: quarterfinals. Portugal: did not qualify. England: Round of 16. Portugal: did not qualify. England: group stage. Portugal: did not qualify. England: fourth place. I could go on depending on your age. Suffice it to say that prior to 1986, Portugal did not qualify or participate in the world cup, excepting 1966 in which they achieved their best result: third place. Of course, that same year England won the world cup. Of course Portugal have a good streak of outperforming England in the last handful of tournaments but unless you’re very young I think it’s not been throughout your lifetime. I’m 19. I watched a bit of 2002 but don’t remember much. And none of the ones before that. euro 2oo4 portugal beat england in q/f . for euro 2008 england did not qualify . euro 2012 portugal in S/F eng loose in Q/F . hope i made the necessary observation and completed your list . England didn’t qualify for World Cup 94. And that pretty much sums up the problems of english self-perception in soccer, if you’d ask me. yes you are right. And maybe England is worse than I think. As Italian I have enjoyed the game but for all those missed chances, obviously the Italian ones. Anyway one can see the skill and will of Prandelli in this national team which do, as he said in the PC, play for creating. While we have in many ways more limited players then a couple of years ago Italy profits a lot from the centrocampo dei piedi buoni, the midfield with good feet, with the likes of De Rossi, Montolivio, Marchisio and of course Pirlo. Bonucci sometimes plays the regista of the defense, a bit like at Juve, although rightly de Rossi and Pirlo drop often deep. Cassano is a seconda punta/second striker which scores little or false ten. Such player allowed Prandelli to develop his proactive Italy which does indeed like to control the ball and the game. ZM has rightly pointed out the results of this dominance. The play was fluid, with the full backs able to push very high up and the good counterpressure and positioning as well as the poor English passes allowed them to stop the ripartenze/counterattacks mostly in their tracks. The few good English chances happened early and against an organized defense. Much has been already written about the English side and I agree on most of it. It is difficult to do better with the available players and the limited time at your disposal. All in all a good game of football and it is good to see that in all four quarters the better and more attacking side advanced. Rooney wasn’t just bad at tracking Pirlo, he was just bad. Poor passing, poor finishing, abysmal decision making in the final third. Can’t dribble or beat a man to save his life. Shockingly even Carroll seemed to have a superior touch. It was a disgrace to take out Welbeck instead of him, who was clearly offering more. Nobody metioned that England lost again with pentalties.As I said once-at the best England can do,they will lose with penalties-as simple as that. This is big wake up call for england on how to play quality footaball,they must learn how to build from the back then move into attacking second,movement of players when having the ball,channells,spacing,gettin options from players,winning second balls.hart was kicking the ball everytime when its goalkick for what,most of those balls england failed to win them.i said Pirlo is the danger man to much space and movement he was given in his zone,he was cool,calm&collected in his play like we know him no pressure was put on his shoulder everytime he receives the ball he would look behind who’s making him no 1 that was the danger.england lack of creative players or special players has proved alot needs to be done to produce talent and nurture it.they need to come up with a system of play then what we have seen from the last to tournaments 2010 (dismall performance)Euro 2012 (dreadfull performance) both this tournaments they were outclassed,outplayed. Ashley Young was poor from minute one in this tournament. Don’t know why but he kept looking to do absolutely everything so quick. Barring some good ‘moments’ from Gerrard, the central midfield showed once again how inept it is at orchestrating possession. Couldn’t help to retain possession even if their lives depended on it. Though its also a collective problem in midfield and up front but the central midfield sets the tone. Constant long goal kicks alone showed the ineptitude and the tone of our possession ability as a team. It was worrying as to how quick the midfield looks to drop deep when they don’t have the ball but maybe that has something to do with possession ineptitude. The defence did its job most of the time but had bad moments though (Terry and Johnson throughout this tournament), that is for sure with the way they were caught out by good movement and of course good passes to those movements. Their life wasn’t made easy by our lack of pressing on the passers as we saw on this game with Pirlo. By now, most England fans know that we have a big gap to fill, in terms of technical ability and tactically, so that wouldn’t be pointing out something new in relation to what we have learned as we have been taught this lesson repeatedly for a good long while now. Though at least I hope Hodgson entertains the idea of a 4-2-3-1 formation in the qualifiers and the friendly against…….Italy. You’re talking about Di Natale, aren’t you? Add to his qualities one more – he would send Balotelli to the bench . Hodgeson has done well to organise and drill the team into the shape and structure he wants to play but lets be honest England didn’t do any better or worse then they would have done under Copello. We would have gone out at the same stage… Probably in the same manner (although i’m not sure we would have been quite as defensive) and may or may not have won the group. I’m left worrying about how we will perform in World Cup qualification with such a defensive structure when winning games is paramount if you want to qualify. I agree with ZM about Young, he has had a stinker of a tournament and really should have been withdrawn. I take the point about Chamberlin being inexperienced and Young being a good penalty taker but if you can play Chamberlin against France in the opener, with Young offering so wasn’t it worth the risk? Rooney shouldn’t have stayed on ahead of Wellbeck but in all honesty I wouldn’t have had the courage to take him off… He is our *star* player and you hope he will win the game for you but in reality he performed worse than Wellbeck and Carroll. I’d love to hear some analysis from Hodgeson or Neville on how they played Pirlo and what the plan was! The sad thing is you knew Hodgeson was never going to change his basic shape to try to counter Italy and once Italy pinned Johnson back (our best attacking player!) it was a slow death with no effort to change the dynamics of the game. It’s hard to judge Italy, Pirlo was magnificent but England were happy to concede possession and territory which made their passing game look so good. They looked beatable at the back and were wasteful in attack. If Germany decide to compete for possession and Italy lose I’m not sure they have the players to hold out in the manner England did last night (or as wasteful forwards to deal with!). I don’t think Rooney was under strict instructions to pick up Pirlo, especially from the point Caroll came on. Caroll was in fact closest to Pirlo on a number of ocassiosn. But I dont think Caroll was under strict instructions to pick Pirlo up either. As you point out with England defending deeper and deeper, Pirlo’s incisive influence waned depsite increasing time on the ball. Especially in extra time Hodgson was happy to let Pirlo have the time on the ball and just keep the compact banks of four. Itlay’s best chances late on where created by Diamenti’s “inverted” crosses. The last person to say the catchphrase takes a shot, as does anyone saying a wrong catchphrase. WARNING. This game is best played in a large group, as the above situations tend to occur very frequently in an England match. Anyone playing this game with only 2 or 3 friends will end up on the floor before the match ends. Alternatively, play it on your own without the alcohol, and just take a sip of tea instead. That’s what I’ve been doing for the euros, and it’s made it much more fun. Although its too late to play it this time, I shall look forward to having a go if we qualify for 2014. Italy dominated possession extremely well (with Pirlo obviously fantastic) but they found it much harder to actually create clear chances. This was a mixture of England defending well against Italy’s forward players but also the Italian system. The two strikers only really looked effective when England had moved higher up the pitch (rarely) and there was space in behind. Otherwise they lacked a clear way of scoring, with the dominance often resulting in long range shot. Italy lack a real presence in the penalty area for their fullbacks (who got into very dangerous positions at times) to actually cross too. This could be a problem for them in the future rounds, as the look good when dominating, but arguably much more dnagerous when counter attacking. England really struggled and it was the right result in the end. The started well by, as ZM stated, getting their fullbacks forward, with Glen Johnson especially influential. I was surprised that England didn’t replicate this towards the end of the game for a last push, as it was clearly a good strategy. But England didn’t get to grip with either Pirlo or the fullbacks. Pirlo was excellent in his passing and creativity from deep, but I was shocked at how badly Rooney pressured him, rarely making any effort at all (though he still look not 100%). The English wingers all found it hard to deal with both the Italian CM’s and their fullbacks, often letting the fullbacks get into very dangerous positions. Worse than this though, England never threatened Italy after the first 30 mins, with Italy’s 3 energetic CM’s pressuring England all game and making them play poor and sloppy passes forward. Italy might do well against Germany. They could return to a 3-5-3 and sit back against Germany, allowing their pacey strikers to break against Germany’s high line. But on the other had, if Germany get their fullbacks forward (especially Lahm) then they could overload Italy down the wings. It should prove a great game. I generally concur with your points. I think the reason why Italy dominated possession is because England allowed it due to tactical and fitness reasons. I am surprised that England players seemed to be less fit than the Italians. Even the old dog Pirlo was running energetically and masterminding the show while English players a decade younger were walking aimlessly by extra time. I also agree with ZM that allowing Pirlo such freedom is criminal especially when everyone knows his influence and capabilities by now. While I think Pirlo’s range and accuracy of passing is exceptional, there would be no other side would accord such freedom for him to dictate a game. The problem with Italy is obvious. I m sure Loew would have noted how every Italy’s move is routed through Pirlo. If you stop Pirlo, you stop Italian attacks. Another problem is Pirlo’s a deep laying playmaker. Being an ex-deep laying (amateur) playmaker, I am well aware of the limitation of this role. This role is most effective when playing a defensive formation and counter attacking tactics. Such play maker is ineffective with an offensive style of play against defensive teams. Other issues with Italy is their lack of quality supporting players in the offensive half. Balotelli is not international class yet in my view (though he could develop into one). Montolivio showed some promise but looked inconsistent. I can’t recall seeing an Italian side lacking in stars in recent times. Perhaps this is a reflection of Serie A. If Italy wants to do better, they need to revert back to 3-5-3, which allows them to maximize their limited talents at their disposal. However, I don’t think Germany will allow Pirlo as much freedom as he had vs England. In any case his position as a deep laying playmaker will mean he has to play long balls to his strikers. Germany’s defenders are strong in one-to-one situation and I don’t see them being troubled by the Italian forwards as they lack the killer instinct and counter attacking skills of the Italian teams of the past. The other way is via set pieces and this is in my view, the best way for Italy to score vs Germany. But frankly I don’t see this Italy team progressing, I foresee Germany brushing them aside quite comfortably. if you watched the game closely then pirlo was either passing the sideways spreading the ball or was passing it upfront . there were three players surrounding pirlo de rossi , marchisio and montolivo but other than de rossi somewhat i dont think he had a little faith in the other and he was reluctant to pass them the ball because he knew that they cannot make the best use of the ball and that either they will take a shot or evidently it will come back to him .even in the build up marchisio and montolivo were not that involved other than passing the ball back to pirlo .i havent seen them doing anything great in the tournament nor are they imaginative . even though pirlo may be picked by somebody but i think de rossi equally good in spreading the ball for which he is not credited . he is a good box to box midfielder but the problem is with the front four as other than cassano and a little bit of balotelli there is a little quality . italians playing close will suit the germans as they can close them down quickly . other than a little bit of pirlo there is no quality in this italian side . Top notche post. I could not agree more. I expected much more from Marchisio. What saves Italy actually is the ability of Pirlo and De Rossi to give killer balls forward and although I belıeve that Badstuber is the best 1v1 defender together with Puyol they still got a chance to outpace them. Although I agree that Maggio is not a great fullback (playing 3-5-2 against 2 wingers and 1 forward is self kill imo) I think he might go in as a wingback and try to replicate the Greek’s goal against Germany. top article as usual. crazy to give Pirlo so much space. Eng players seemed too tired to press. i thought playing younger players had helped that to some extent in earlier games, but i suppose those 2 key center m/f players were still over 30.
right to point out italy only scored 1 from open play. overall for england, can’t beleive the rubbish being talked on the old phone-in’s. still criticising cappello while in the same breath praising hodgson. if cappello’s Eng had been so overwhelmed ( 20 shots on target from italy ) he’d be strung up from the stadium roof. cappello’s big mistake was not playing Hart. Hart was the difference. we’d probably not made it thru the group with rob green or david james. Insightful summary, I think that your last paragrpah absolutely hit the nail on the head concerning Hodgson’s approach to this tournament and need to work towards a more proactive approach in the future. As someone pointed out much further up in this comments area, Rooney is a player who will chase back to win the ball, really like a kid in the park constantly running after the ball, he isnt a real “man-marker” at all, to be honest he could have done better to close Pirlo down, but i dont believe Hodgson instructed him to do so. Rooney wasnt at his best, he did try, but looked a little tired towards the close of 90 mins, as ofcourse most of them did, not easy chasing the ball for long periods! But i wonder that off the back of a good season for UTD, him missing the first 2 games lost him alot of sharpness, but oh well, hind-sight is a wonderful thing n all. Hodgson however i must credit, leading up to the tournament England didnt consider to have much of a chance in this competition, yet, they topped the group, definitely were not easy for oppositions to break them down, and i now think to myself, the gaffer did well considering his resources, credit to him for the influence he has put across his team, certainly this set of England players looked much calmer then ever. People may say oh England do not have the quality etc, but i believe over the years they have had good quality, but it just hasnt been fully utilised for some reason, the players fault? the managers fault? who knows. But after this tournament i think England can be cautiously optimistic about chances over the next 4-8 years (honestly) (and World Cup 2014 might be too soon). Id love to see during the up and coming World cup qualifying campaign a few youngsters given a proper run out for the team. England DOES have good young players, but pressure must not be heaped on them, especially on ones so young. Im sure ive missed out on other players but i believe roughly this team/squad could really grow into something really good over the next 4+ years. Added A.Cole at LB because i still think his qualities can be utilised for a few more years left, brilliant player he still is. Just a quick thing to add, i remembered this just now, Anderson (Utd player) once said how possession is so important, he said .. something along the lines of “When you have possession it is important to have control of it, its much less tiring to pass the ball to each other, rather then running up and down the pitch, you make the ball do the work instead” Something along them lines, but England should relate to that. Your team looks reasonable but overlooks the fact that the manager is Roy Hodgson, and the system will be 4-4-2 (you can call it 4-4-1-1). Harry I totally agree with you that there are some good young players coming though who could make England a strong team in the next 4 years. This is my completely revamped squad for 2014 based on what I see today as being the players capable of playing the modern game. The 4-4-2 system was the complete wrong way to play against the Italians. Hodgson would have been better playing five in the middle with Jones sitting close to Pirlo with Wallcot and Young wide as out balls. Jones has the energy to get up and down the pitch, unlike Gerrard and Parker, whilst ruffling some feathers in the middle too. The substitutions were baffling too, England did not have possesion of the ball and his changes did nothing to rectify that. Carroll did offer a good option when he came on but the midfield was so deep that the ball was lost almost immediatly. Henderson made sense to replace Parker who was tired but he should have been on for Young earlier to sure up the midfield when Italy were dominating. Hodgson seems to have escaped a lot of criticism simply due to the fact he only had a few weeks to work with players, he got a lot wrong. Yes the squad is limited but he still had options to work with, Henderson is not as bad as everyone makes out and Jones could have given a lot of energy to this team. But as far as I know Löw will never consider something like this. But I think Italy is lost, if someone is man-marking Pirlo. If Pirlo plays deep, it will have to be the attacking midfield (the one behind the lone front man) that does the pressing on Pirlo, whereas Bender is a defensive midfielder and although he can press very well, not sure he should be so far forward. I think Kroos would be a better option in the hole, with Ozil to the right. I disagree. One of the advantages of Prandelli’s “quality diamond” is that each and every one of the four CMs has playmaking abilities. If Pirlo is man-marked, De Rossi and Montolivo (or T.Motta) will have more time on the ball to create. Same with Marchisio, even if his job is a bit different. ok, I didn’t know that the others have playmaker-skills. Thats probably the reason why Löw said that taking pirlo out is not enough. Given that Hodgson is seen as a good reactive coach, it’s strange that England didn’t react to Italy particularly well at all. Even the average punter would have been able to pinpoint Pirlo before the game as by far Italy’s biggest threat. Hodgson surely recognised that he had to be stopped. Pushing Rooney back on to him was never going to be a wise strategy – it was unlikely (and perhaps undesirable) that, as a striker, he would track so far back. Pirlo would obviously just move higher up the pitch to get time on the ball. Either Milner should have been moved inside (with Walcott/AOC or Henderson replacing Welbeck) or Henderson should have replaced Welbeck, with Rooney up front on his own. Apart from running the channels quite well early in the game, the two strikers offered very little. England were quite simply overwhelmed in the centre. Maybe I’ll be proven wrong, but I doubt Hodgson’s the man to do this. Also: I wonder how Loew will react to the threat of Pirlo. Germany’s pressing game is probably quite well suited to dealing with him. However, if he wanted to be more cautious, he could bring in Kroos and move Ozil out to the right. Ozil’s strange in that sometimes you seem to get decent defensive awareness from him (stopping passes into the holding midfielders) and other times you get nothing like it (Bayern Munich vs RM; the 5-0 Barcelona game last season.) I guesss he’s so vital to this Germany team, though, that moving him out of position would be a big call. I just tried to respond as well , but it’s ended up at the bottom. ZM: get this sorted! Just because he only had a month doesn’t appear to justify neo-neanderthal selections and tactics. IMO a guy way out of his depth – and hardly surprising when you have guys like Neville calling shots with zero experience or track record. Until England builds a genuine high performance culture things will remain half arsed. See for instance the transformation of Australian cricket from the Kim Hughes era to the Alan Border/Steve Waugh era. Roy is completely unqualified to manage england. It’s like apples and oranges. Neville has often been described as a cultured player and he plays heaps of games for Manchester United and does a good job on the TV. Obviously England has massive problems in youth development. But, that’s not a football specific problem. Look how the Germans reacted to the liberalization and deregulation of the European player market in the late 90s. The clubs, not owned by financial investors, sheiks or oligarches, decided for the mid-and long term benefit and invested in youth development programs and training internats. Regional cooperations between top and midfield-clubs were established. The DFB coordinated these works and transferred skills and procedures from successful educating clubs to others. The government provided special schools for young players. 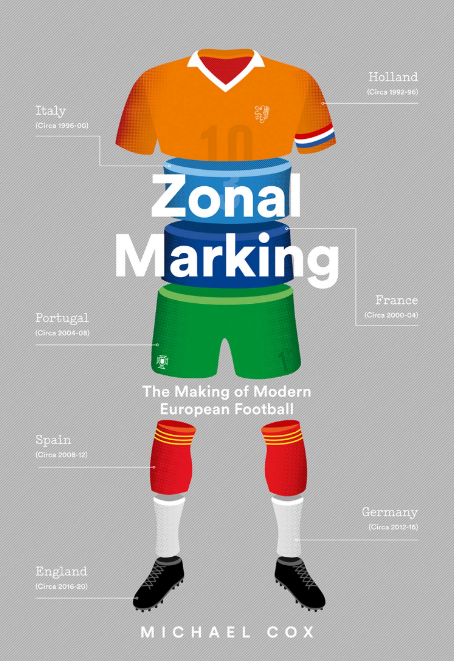 In short: Football copied the education model of the (former) German Economic model, the Soziale Marktwirtschaft. The actual National Team ist the last success of a working economic and educational model GB has never had (compare any public school mainly visited by the immigrant underclass in GER and GB). German foorball is still social democratic. Clubs are owned by the supporters (50+1). Ticket prices are low. Gouverment, Clubs, League, DFB and supporters coordinate their interests and solve conflicts (often) in consens, like companies, unions and gouverment do (did). The English football is less democratic, primarily orientated to the interest of club-owners. And they don’t care about youth development, mid-term inventions, supporters or the national-team. Not going to happen. Muller has an excellent anticipation and Gomez/Klose will press him well. I remember one scene in the first half of the extra time where Caroll looked way to stupid when he tried to put pressure on Pirlo by running horizontally – guess what Pirlo did? Ran forward with the ball, 40 yards or more. England were ridiculous and this is why I don’t quite understand all the fuss about Pirlo (still great player though – no doubt about that). Germany are a whole new level for Italy, especially the vertical game will give Italy a hard time, whenever England tried that, the Italian defense looked quite exposed and frankly I believe that Italy looked good against Spain because Spain don’t play vertically. If Low plays Kroos on the 10 Germany will be a lot weaker in that respect. Kroos is good at retaining the ball, as #6 or #8 okay, but I am quite sure that we will be seeing a very direct German team on Thursday which Italy won’t be able to cope with. 2-0, 3-0, 3-1ish, but without Kroos. and btw Özil did a superb defensive job in the last clasico… no need for Kroos at all!! I’m not English but I’m England national team supporter(God knows why?! ).Last night game was embarassment for England.Siting deep without any intent to press and than punting the ball by Hart every single time,unbeleivable…Yes the team is limited,yes they lack technical skills and creativity but to show this much respect to Italy is shocking.When Hodgson was apointed a lot of people waried that England will play like this and that exactly happened!England played English football from 70’s and 80’s with “English long balls” and most of players are unfamiliar with this “tactics” because in their clubs they play “normal football”.If this is Hodgson’s vision then he should use Stoke City as a national team for WC 2014. Is two years period enough for a burned & buried team to rise again from its ashes? I’m talking aout England chsnce for WC 2014. Are these the likely formations? It’s gonna be a very intriguing battle. seems quite likely, except for bender as right FB; me guess would be boateng. löw obviously trusts him and always defends him on television against accusations of sloppiness/bad defending (and imo löw is right). also, if müller and reus play, i consider it more likely, that reus will play on the left and müller on the right. müller tends to play better on the right and reus looked good on the left against greece. I think Prandelli considers Diamanti too much an offensive player to give him his false trequartista duties (which is more of a midfielders role). But the strikers dilemma is actual, and personally I would give the nod to Borini, who can be the most Inzaghi-like player of them, i.e. what current Italy really needs. Paired with Cassano for 60 minutes, then Diamanti. Going to be interesting to see how Hodgeson does now he doesn’t have the 1 month excuse. England will get nowhere with Hodgson in charge im afraid. While the media love him, and the old fogies at the FA love him…..he is too old fashioned and stuck in his ways to be able to take England to the next level. He always plays deep, narrow, defensive and doesnt care about possession, which imo is criminal. Who will play better after an hour….a player who is tired physically and mentally after chasing the ball around, or the player who has had the ball and is dictating the play ? Easy answer. I was glad when Hodgson was sacking from my club Liverpool, and i was utter;y dismayed when he was named England manager as i knew what was coming for them…….and it wasnt good possession attacking football that the upcoming young English lads will want to play and what most of them play at the clubs. Hodgson is not the man to usher in the new wave of youngsters over the next few years, and i can guarantee the World cup qualifiers is going to be a dismal affair. Sure we may qualify, but it will be tight and aweful to watch and i bet the youngsters wont be happy with it. I think you’re being a bit harsh on Hodgson. Yes, it would be nice to play a cutesy, attractive passing game. But even with the younger generation of English players, this would be doomed to failure against top sides like Spain/Germany. Look at England’s “up and coming” players – what kind of tiki-taki players do we have: Wilshire? Maybe Cleverly (although everyone seems a bit too quick to hype him on the back of a handful of games)? Even if we played nice pretty football with those two at the heart of it (injuries notwithstanding), we would come up short against the likes of Spain, Italy, Germany, Portugal (as we always have done). Whether we tried to play “nice” footy, or just route-one 4-4-2, the outcome would be the same. The failure to mark Pirlo was the root of the problem. If Rooney had been told to, then why did Roy not do something about it? When interviewed after he mentioned how well he knew Pirlo, having managed him in the past. That makes it all the more odd that he didn’t make sure someone kept tight to him. Rooney had a poor game, and so did Young. I was amazed when he took Milner off instead. I was also surprised that he brought Carroll on when our biggest problem was not keeping the ball. Wellbeck had done pretty well. I suppose he couldn’t take off Rooney because of pens, and also what the press would say. What was the point of putting Carroll on and then never providing a single worthwhile cross? It seemed to me that England played quite well in the first half, and for the first 6 or so minutes of the second. As soon as the substitions were made all semblance of coherence went. Where they had put together a few good moves and passed OK at times in the first 45, from the 60th minute on they barely managed to get out of their own half. I think Roy deserves more time, but I am not too hopeful given what he has to work with, and the errors he seemed to make tactically yesterday. Scholes would have bossed the midfield. Scholes whould have bossed the midfield. Not that he isn’t a great player but you have to remember the England team that would have been playing around Scholes probably wouldn’t allow him to do so. Pirlo is also superior to Scholes. I doubt simply dropping Scholes into the middle of England’s lineup would have made much difference. Put Pirlo into that England team and we would have seen less of his ability. So no, Scholes would not have bossed the midfield. Exactly. If Scholes (or Wilshere) had been in the squad, he would have been competing with Gerrard or Parker for a spot in the team, which would still have been an inflexible 4-4-2. And if he had been selected ahead of, say, Parker, he would have been expected to play a similar role to Parker. He wouldn’t suddenly be dictating the match in Pirlo fashion (or even Scholes at Man Utd fashion). Hodgson has valid excuses for his tactics, but the fact is, he set England out in very limited, rigid manner all tournament with no room for much imagination and never altered the team’s formation or shape in-match. Scholes would never have had the licence or framework to play his preferred style. England were never fluid enough and the movement from the forwards was rarely intelligent enough for Scholes to have worked with. Looking forward, we can forget Scholes for now, but it will be interesting to see how Hodgson assimilates a fit and in-form Wilshere into the XI, if he makes him the engine of the team (England’s Pirlo or Xavi, in a way), or limits him in the way he has Parker and Gerrard. That’s the thing though, I just don’t think anybody, regardless of ability can be ‘England’s Pirlo or Xavi’. Firstly, as potentially good as Wilshere is I doubt he will reach the level of either of the other two, nor do I think England is likely to produce anyone else who will. Secondly, as I wrote earlier, the team around Wilshere (or whoever it may be) will not be good enough to allow him to function as ‘England’s Pirlo or Xavi’. There are just too many limited players, technically and tactically. Even if Wilshere was as good as those two, he’d be stifled by his team-mates. I agree the rigid 4-4-2 wouldn’t help but it’s not the only reason. Oh, I agree: WIlshere will never be (or have the chance to be) ‘England’s Pirlo or Xavi’ – he could be ‘Arsenal’s Pirlo or Xavi’ but even that is very unlikely (because Pirlo and Xavi are once in a lifetime-type players). He won’t be a replica but he could fulfil that role as it can exist within the England structure – if the coach decides to make him the playmaker. Hodgson could make him the engine of the team, the player who dictates play (even if that play won’t be akin to Italy’s or Spain’s styles of play). With a Parker-type next to him (say, McEachran or Rodwell in the future), and a versatile midfielder like Cleverley in a midfield 3, Hodgson could entrust Wilshere with the responsibility of running play (much as Lippi and Prandelli have with Pirlo, and Aragones and Del Bosque have with Xavi) , and I think he should. Hodgson could build an England which is a very good reactive difficult-to-beat team (and I suspect he will), but even if it results in England having a terrible World Cup 2014, I’d prefer to see an attempted transition to a team that can retain possession and control the tempo and flow of matches. The major problem is, as you say, if England will ever have a team with the ability to make intelligent runs to enable Wilshere (or whoever) to control matches. I’m hopeful that with Welbeck and Oxlade-Chamberlain developing well, and Sturridge at Chelsea, we could see a more assertive England XI at Euro 2016, one that has the technical ability and tactical know-how to control play intelligently. Fascinating comments. No, I’m not making fun of you. You see, recently I read David Winner’s “Those feet” and what do I find here? About 100 comments dripping of declinism. Fascinating indeed. That being said, I think Hodgson did what had to be done and that is building on the one strength your national team has: defensive discipline. It was all about denying high quality chances of scoring and that did work out quite well and getting few chances yourself, but those of high quality. Well… that part didn’t work out quite as intended, but there were some situation were you came close. Not the most attractive way of playing maybe, but was there really any alternative? I don’t see any natural regista or Nr10 among english players of the necessary quality, so how is that poor man supposed to build a team focussed on poessesion and dominance? Maybe there is the need for change at the youth level, but from the outside it looks more like the transition is gar more crucial. The reserve league must go, players need to compete in real tournaments and not in some operatic strange something. Of course that requires to stop the big clubs from hoarding talent… so quite a conundrum. Anyway, overall the tournament didn’t go too bad for England. Given the circumstances a real hummiliation was not out of the question and i suspect you were spared that fate mostly by french sloppyness in the last group game. At least the english team wasn’t without a chance against Italy. Against Spain they’d been chasing the ball for 90 minutes… and not for just about three quarters of play time. Another thing that needs to change: stop refering to 1966 in any way, good or bad. It is an obsession and is holding back since decades. If there has been ever been such a thing as a pyrrhus victory in football it has been that world cup. Oh well, have a good one. I would put forth the idea that Lampard, had he been available, could maybe have played the deep-lying CM role for England that people have been saying was missing. He works hard, can tackle, has stamina, tactically astute, and had some of the highest pass-completion stats for a midfielder in the premier league this season. As well as some very good, very important offensive passes (To Ramires against Barcelona for the winning goal after taking the ball off Messi, and again at Camp Nou for Ramires’ goal before halftime, to Drogba for his goal in the FA Cup semi-final.) He played deeper a lot for Chelsea this season, and was quite effective at it. The Problem of Pirlo marking is much bigger than you guys think. Not thanks to him but De Rossi, who backs him up when he falls under pressure. They simply switch positions and Pirlo gets to go a bit further, which makes impossible for an attacker to press him.It was much easier to mark him in Milan due to lack of creative midfielders around him in last 4 years but De Rossi is great complementary solution if attackers go pressing. It wasnt the lack of creative midfielders/players that was the problem @ Milan, it was the lack of runners in the tram, the midfield was too one paced and once they lost Kaka, it made an already slow team even more slower. England didn’t have to play without a central midfield. Hodgson could’ve had Carrick if he’d made him a sure starter — and he should’ve been imo. He also could have likely gotten Scholes out of retirement for one last tournament. That way he’d have two passers who’ve been great together at club level this season. Then play with Gerrard/Parker further forward and one striker. England’s most popular pass combination last night was Hart to Carroll. This happened 18 times (Gerrard, by way of contrast, only passed to Parker 4 times). The problem with the use of the long-ball tactic was that Hart’s and Carroll’s pass completion rates were around 50%. Which means, 3 out of four long ball punts from Hart went straight back to the Italians. Italy then kept the ball and built up an attack before, in most circumstances, shooting wide. Then the cycle repeated itself – over and over. It was the most foolish and pigheaded football I’ve ever seen: far from putting Italy under pressure, it handed Italy the ball and the opportunity to build up an attack on goal. 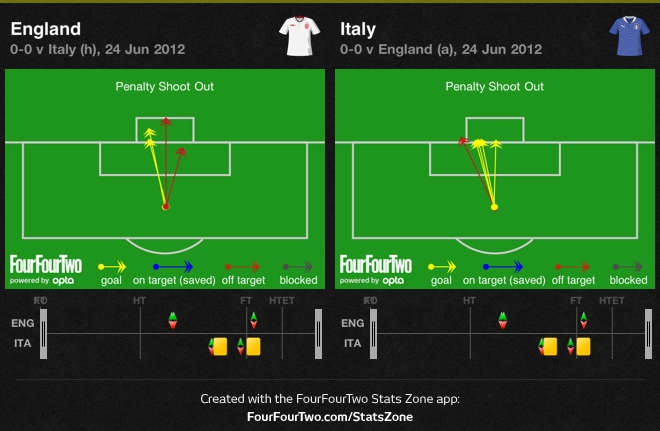 Fortunately, England’s back four played well limiting the Italians, on the most part, to half chances. NOTE – I think Carroll is a valid plan B – but he needs to be focus of crosses, not goal kicks. England simply don’t have a passer — that’s why they can’t keep possession. To my mind, there are three player who could fill that role: Carrick, Scholes and Wilshere. While Scholes and Wilshere were never likely to play at the Euros, I can’t understand Carrick’s exclusion. Reportedly, he wanted a guaranteed starting spot. Roy should have offered him that. Indeed they don’t have a passer but it’s also their inability to control basic passes that let them down from time to time, right across the team. Also, often they receive the ball and control it but it would be a touch that slows the move down or takes them towards the wrong direction. A better passer in midfield would have helped slightly but his team-mates would have let him down. Does anyone think Italy will win against Germany? The problem with English players is that they dont like to move towards the ball, they either run away from it or they stand still waiting for the ball instead. As well as the terrible ball control from certain players, the lack of intelligent, incisive movement from the England players was unbelievably poor all tournament and the #1 problem for me. They were such a static team, completely lacking in fluidity. It’s lucky France lost to Sweden, because Spain’s pressing would have humiliated England. They would never have kept the ball for more than 1-2 passes. Yes, very predictable and unintelligent movement. Lots of running in straight lines, with and without the ball. Players receiving the ball while facing wrong angles, standing still and taking touches that limited their next move. Poor first touches. Bad decision making, on and off the ball. All very basic stuff and though England are expected to be worse at all these things than the ‘big’ nations it’s still surprising to see at this level. The irony is that Capello moved away from 4-4-2 after the last World Cup, and the team showed progress, albeit small. But then Hodgson decided to forget that exotic nonsense, and it was back to 4-4-2 again with Rooney playing high up the pitch. But Hodgson is a 4-4-2 long ball merchant. And he is staying in the job for 4 years … God help us! I wish I could be more positive, but try to argue to opposite. It’s not so much 4-4-2 that is the problem but the amnner in which Hodgson deploys it. It’s a bog standard, linear formation. There is no flexibility, it’s simply far too rigid. One thing I want to add, when you defend deep which is not a bad idea, you need to make sure your CB can hoof the ball accurately, otherwise the ball keep coming back. Rio is not very great at defense as he used to be but he can kick the ball reasonably. If you want to face team like Spain which love to pressure high, you need to execute very good long ball tactic otherwise you won’t get out of your own half. Pirlo is the man of the hour. Not only for his 120min effort, but also for his panenka in the toughest of momments for Italy. Pirlo was immense, and although part of it must be pinned on Rooney, the way Pirlo managed his game was amazing. In many momments Pirlo shuttle forward when not in possession (even higher than the Rossi/Marchisio pair) and was in an excellent position when Italy did recover the ball from their intense pressing. That meant Rooney was too far up the pitch to track him. That’s how Pirlo was so free in the 1st half. In the 2nd half, when Rooney tired (obviously not even close to 100% fit), Pirlo was no longer required to move up the pitch and could create from deep at will. With Gerrard, Parker and Rooney all gasping, (and not willing to press in the 1st place), Pirlo dominated the pitch. His passing display was amazing, not only in his effective distribution, but also for his ability to breach England’s mommentary high line. England, in that regard, weren’t sitting deep (per se) for most of the match… they were retreating gradually has Italy moved the ball around. That denied space betwen the lines for the Italian midfielder to break into, but also made them vulnerable to Pirlo’s (and sometimes Monotlivo’s) passes in behind the defense. Back to Pirlo, and to the momment it seemed England were set to get away with the match, after Montolivo’s miss and Rooney’s conversion, the italian magician pulled a rabit from his hat and turned the whole mommentum around. And so crucial that psichological effect is in a penalty shootout. Pirlo was king and master of the match and was nothing short of brilliant throughout! Another footnote of this match was Hodgson’s substitutions. Especially the one concerning Milner. And that has been a pattern in his carreer. Milner might not be the most talented player on the pitch, but sometimes I feel there’s some disrespect to his abilities and what he brings to a team. He was probably England’s best player on the pitch vs Italy and was having a great start in the 2nd half (beating Balzaretti on 2 plays). This is a pattern that also happens in City, many times he’s playing well and gets dropped out… it would make some sense if had fitness problems, but his stamina never seems to run out. I feel there’s a misconception concerning his technical ability, but despite not being in the same class as Rooney, he’s still pretty good with the ball at his feet. If there’s a player in England’s squad whose status is somewhat underrated, I’d argue that player is James Milner. Another note from this match and from the whole competition is the trend for positive teams to achive good results. Much in contrast to what happened in the major club competitions in Europe. Italy is lucky that Pirlo’s game relies on vision rather than speed or strength, as it cannot afford for Pirlo to retire for another few cycles. He has Italy’s sole creative force for almost a decade. He was the reason Italy won the World Cup in 2006, and his lack of fitness in 2010 was the reason Italy played like semi-professionals in South Africa. I cannot think of a national team (at least a “big” national team) that relies on one player so much game in and game out. i never knew mate that you are so funny Henderson has previously done well as a substitute simply by providing fresh legs and mobility.come on mate you cant be more funnier than this had he provided the mobility then liverpool would not had finished such lowly .another one is milner is a very hardworking and discplined player come on mate where did you made this observation . how come my eyes see different milner , downing , henderson how come these guys even get to be in the squad let alone considered . i wouldnt describe as to how awful they are . but seriously you need to stop being funny and describe these great players in such lowly words . i think hodgson has this policy of atleast keeping one dumb player on the field either milner , henderson if both are not there then rooney starts to act like one . i was the english newspapers today and most of the post or reports which constituted were only constituting players from the top clubs only i dont know why . why cant they think of players from swansea or norwich who had done very well and much more suited to play in a system which needs to be played against the continental teams where pressing in now the call of the game .ability to pass the ball and keep it under pressure and win one on one challenges is the necessary skill of today’s footballers and many of these players from these lowly club have excelled . so my call why hasnt hodgson looked after these players . may be he wouldnt had been criticized so much had he taken them to tournament and most importantly the experienced that they might had gained may had helped them to become better . untill now i was thinking that only the indian cricket team was the only one which was being selected blindfolded but looks like english football is no different . 1. He would have been criticized more for calling up players with only u21 (sinclair) or no (dyer) international experience. He made safe choices, picking from teams with good reputation (I don’t think this is how the media SHOULD operate, but what happened when Walcott was called up at 18? There was a firestorm). 2. This isn’t the u21s. You don’t bring a player into your international squad to make them better. You bring them in to make the squad better in order to win games. He can mess around during friendlies and in qualifying matches, but he would be roasted if he messed around at the Euro. so what is your point that england should keep picking hopeless players who wouldnt perform . secondly if dyer and sinclair can stretch the play then the midfield diamond that you are talking about doesnt remains a diamond somebody has to go hep the full if they are able to cause problems to the full which is very necessary did milner and caused problems to the full back . i really dont get the point would these just stick to their positions and get their back four exposed . i dont think so . if you had read the analysis correctly then italy made england to play the way they wanted them to play not the other way around so if you have somebody in your team that can create flutter into oppositions then you needs that to dismantle their game play and make them play to your tune . last but not the least if you read his last para then it clearly said that england can rely on such defensive style they need to be proactive means you the teams dance to your tune and not the other way around . hope you understand some football my friend and what reputation are you talking had they been such good their teams would had finished in such low places . how much did england achieve taking such reputed team players to the tournament . and you are talking about milner hell he couldnt even get a substitute appearance for city for the last two months . so dont just post for talking . talk some sense . Italy would make england play this way whoever was on the wings. Dyer and Sinclair can press all over, but it wouldn’t matter because they would just be dragged out of position by italy’s superior passing. I think Hodgson isn’t the best manager out there, but he consistently emphasizes the same thing: being solid at the back. Two runners wouldn’t accomplish that task. So I’m pretty sure he was right not to go proactive (short term). They took a superior team to penalties, where its 50-50; how far would england have to go in this tournament to appease you? I don’t think they could be that great of a side, probably in the top 8 in Europe but outside of the top 4. With respect to media response to selection, I’m not saying its right that they expect the manager to pick the same boring players over and over, I’m saying that they would jump on a manager if he brought inexperienced players to a major tournament- walcott at the 2006 world cup is my example here. Hell, I’ll even defend Milner. He can play in the center to provide flexibility within the squad. He can also play as a compact and withdrawn wide midfielder- something I’ve never seen dyer and sinclair do. I will admit I haven’t seen them much, but they strike me as wide forwards who can push on and press the fullbacks well. This would not be useful in the system Hodgson uses because they would be isolated from the rest of the team and there would be space behind them to exploit. Especially against an Italy team whose forwards are moving wide to find space already, advanced wingers would leave Johnson and Cole exposed. An ‘England team playing tactical, winning football that entertains’ has never happened before and I don’t expect to see one in my lifetime. Particularly the ‘entertains’ part. The last test of a leader is the fact that he leaves behind him in other men the conviction as well as the will to remain. The English National Team, damned if they do and damned if they don’t. How many of you went into the tournament expecting progression through the quarterfinals, especially after Hodgson’s recent appointment? The players stepped up. Gerrard was a fantastic captain, the defenders were solid, the midfield was stifling, and the forwards looked dangerous on the rare counterattack. You can point the finger at a few of the players, but they are the younger ones and will improve with time and with a sustained vision supplied by Hodgson. Would you prefer they took a swashbuckling approach and consequently got run through like Maradona’s Argentina? Which leads me to my second point. England has never been a ball-playing team, and to criticize their technique and ability to retain possession is misguided. They have always employed direct, long ball tactics, which is synonymous with lower percentage passing. Whether they could become a ball-playing nation and should are separate discussions. I think they could become one; I don’t think they should. Do you criticize the Spanish for playing to their strengths? The Spanish have the technique to become a defensive counterattacking team. They are professional footballers — they have the technique to play any tactic. Should they become a counterattacking team? Why criticize the English for playing to their strengths? Overall, the team went beyond the expectations or at least met them. They were within a whisker of making it to the semifinals! With more managerial continuity, they will improve. They certainly don’t need to tear up their grassroots operation because of a perception that they can’t play the ball. there´s no preview of Portugal and Spain? People fail to realise that this was Hodgson’s doing. He didn’t want to hold onto the ball otherwise he would have invited Carrick and Scholes. People belittling Gerrard and Parker fail to realise that both had 80%+ possession statistics – as good as the best in the tournament. The team wasn’t built to hold the ball and they got dominated by almost all the teams they faced. As the writer has pointed out, letting Pirlo stroll around was unforgivable. If Rooney’s job was that, then he failed miserably. For me, the fault is with Hodgson. He will not change from his decades old tactics, but he should have reverted to a 4-2-3-1 with either Henderson or Jones in the middle of the 3 and sitting on Pirlo. This one blunder cost them the opportunity to have actually competed in this match. I think your article is a real winner. Your content is informative without being boring and clearly stated. I think you¡¯re ideas are right on. Madrid do not play 4-4-2, and even if they did, they play nothing like Hodgson’s 4-4-2 in terms of strategy. I think their default formation is 4-2-3-1. Cheers. Yeah, would be very surprised if Kroos started in the middle instead of Ozil. The team would lose so much going forward. It’s just an option which Loew may consider. Germany’s approach to stopping Pirlo will probably be more about pushing high up the pitch and putting Italy’s midfield and defence under pressure rather than looking to man-mark him. They will defintiely give him less time on the ball. On Mueller: I think he should definitely start. Schurrle was disappointing in the last game. Mueller offers good movement, allowing Germany to be more fluid, whislt also being able to stay wide and cross. He’s also defensively disciplined. He’s an important player in this side and deserves to start on the right vs Italy. Although Schurrle replaced Podolski. But anyway no fancy changes to be expected, some luncatics were elaborating on the benenfits of Bender replacing Schweinsteiger to take Pirlo out. I agree on the rest. But I dont’t want to fuss too much about the semi-final, this is still the England Italy thread. I just don’t see how Italy are THAT great a team. Good team – no doubt but <Portugal imho. And people talking about the Balon d'or for Pirlo… give me a break, he has not even played in the Euro-League this season. and again scroll down I don’t get this done. He won Juve the Scudetto and now if he wins Italy the EU Cup he will deserve it. He is 33 and plays like 28 years old at his peak having the inteligence of his current age. He is making Xavi look like the second best playmaker. He is an amazing player, definitely one of the best this season.